Stunning handmade fusion glass wall clock. Set in a very slim gloss black glass design, but with a funky twist and turn design at the bottom. 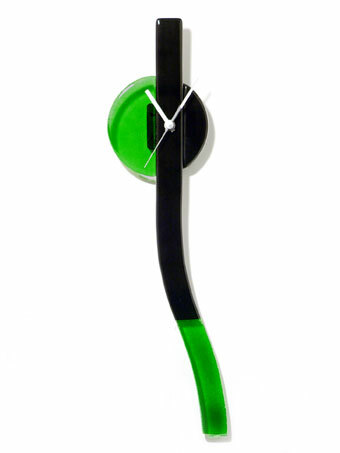 The clock face is fused with a half circle translucent lime green glass, as is it's bottom section, adding to the wow factor of this very contemporary clock. Width of the clock face is 12cm and length is 50cm. A longer version is available on this page also. This clock is induvidual and handmade so is sure to draw comments from everyone who sees it!